After the success of their Feb. 24 Supper Club at Green Flash Brewery, Waypoint Public thought it best to continue the momentum. On Wednesday, March 12th, North Park’s notable new bistro & beer bar, Waypoint Public, will team up with one of San Diego’s top rated breweries, The Lost Abbey, to kick off the restaurant’s very first dinner for its brand new brewery series. Housed inside of Waypoint’s newly constructed private event space, dubbed “the bear den”, this inaugural event will feature an incredible nine-course lineup by Executive Chef Amanda Baumgarten, paired perfectly to a variety of Lost Abbey’s rarest and most exclusive brews – a handful of which are off the market and will NEVER be reproduced again! The Lost Abbey / Waypoint collaboration is led by none other than the brewery’s Co-Founder & Director of Brewery Operations, Tomme Arthur. Among beer nerds, few brewmasters are more revered than Tomme. As one of the most cutting edge brewers in the nation, his unique approach, creativity and enthusiasm helped produce San Diego’s now internationally respected beer scene. Spearheading the kitchen, Waypoint’s Executive Chef Amanda Baumgarten spent over a decade training and working at several of the most prestigious restaurants in the industry, including four separate Michelin-starred dining destinations (La Tante Claire and Le Gavroche in London and Melisse and Patina in Los Angeles). The Bravo Network’s Top Chef veteran has gone on to become the Executive Chef of both Water Grill in Los Angeles and most recently opening Herringbone in La Jolla. Waypoint Public is quickly becoming a premier location for food and beer pairing in the city. Their menu dons pairing suggestions from every angle, and many of their standout dishes incorporate beer in the actual recipes. As an avid homebrewer, Chef Baumgarten’s deep understanding and appreciation of beer and food coupled with the immense body of knowledge possessed by her Waypoint Public beverage-directing counterpart, Brian Jensen of Bottlecraft fame, makes the beer dinner series the most natural progression of their talents. and Lost Abbey Cuvee de Tomme; and lastly, 9) an After Dinner Drink with Lost Abbey Sede Vacante. The Lost Abbey Dinner at Waypoint is just the start of a series of monthly, brewery paired price fixed dinners, which include Hess Brewing (Wednesday, April 16), Sierra Nevada Brewing Co. (Wednesday, May 21), Dogfish Head Craft Brewery (Wednesday, June 18), The Bruery (Wednesday, July 23), AleSmith Brewing Company (Wednesday, August 20), and Ballast Point Brewing Company (Wednesday, September 17). Don't miss the inaugural Brewery Dinner on Wednesday, March 12 at 6:30 p.m. Due to the rarity and value of these exclusive brews, this 9-course inaugural beer dinner is priced at $150 per person, and seating is limited to 25 attendees. 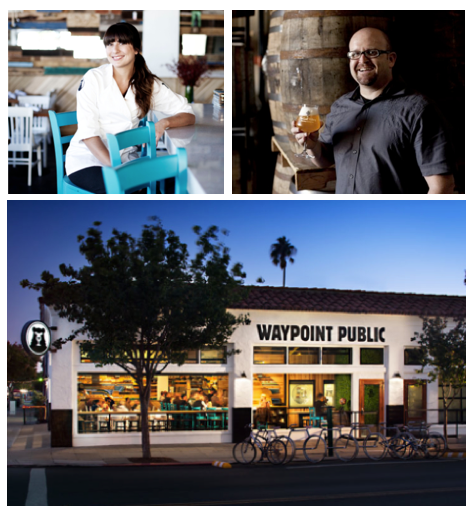 To make reservations, call Waypoint Public directly at (619) 255-8778 or email events@waypointpublic.com. Early RSVPs are highly suggested, as this event will sell out quickly! Waypoint Public is located at 3794 30th Street. For more information, visit waypointpublic.com.